The Rain is Coming... Get Your Sand Bags Ready! It is Southern California, so estimating the amount of rain we will receive each winter is still anybody’s guess, but even when they say it will be a dry winter, we usually still see quite a bit of rain and flooding. That being said, now is the time to start preparing for potential flooding and erosion problems. The use of sand bags and erosion control bags is a simple but effective way to prevent or reduce flood water damage and erosion problems. 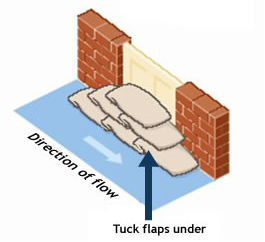 Properly filled and placed sand bags can act as a barrier to divert moving water around, instead of through, buildings. Sand bags by themselves do not guarantee a water-tight seal, but are satisfactory for use in most situations. 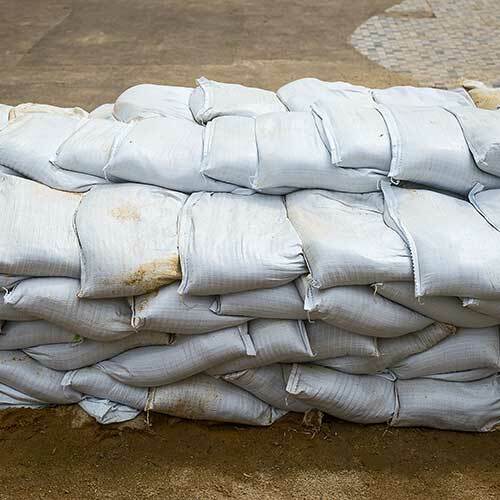 Sand bags can also be used successfully in conjunction with plastic sheeting to create a more water-tight barrier to hold back flowing or standing water. There are a couple types of bags that are commonly used in flood control and erosion control situations. Untreated burlap sacks are available at most local feed stores. The problem with these bags is that they can quickly deteriorate when exposed to the elements or filled with the wrong material. A better option are the pre-filled woven polypropylene bags which are designed to hold up to the elements (Water and UV resistance) and filled with the appropriate materials. RCP Block & Brick Flood Control bags are of the 100% woven Polypropylene variety and are each filled with approximately ½ cuft of concrete sand. Sandbags are generally filled to around half of their capacity in order to prevent the bags from getting too heavy and also permit the bags to be stacked with a good seal. Remove any debris from the area where the bags are to be placed. Place bags lengthwise and parallel to the direction of water flow, with the open end (if filled at site) or sewn end (if using pre-filled bags) facing against the water flow. Line the bags up, placing each new bag atop the unfilled portion of the previous bag. This creates a good seal between the bags. Tamp into place to eliminate any voids and form a tight seal. For multiple layers, stagger the joints similar to how a brick wall is constructed. With the center of the bags of the upper row positioned over the joints of the bottom row. This basic stacking method can be used in an unsupported construction of 3 layers. For higher, unsupported construction, you should use the Pyramid Placement Method. If supported, as up against a building, you can continue to add layers. Pyramid Placement Method is used to increase the height of sandbag protection in an unsupported construction scenario. 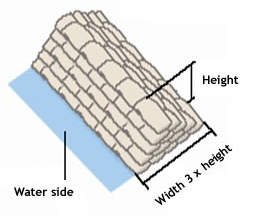 This is accomplished by placing the sandbags to form a pyramid by alternating header courses (bags placed crosswise) and stretcher courses (bags placed lengthwise). In instances where an additional barrier of water protection is needed, such as when protecting a structure from water entering, a layer of plastic sheeting such as Visqueen can be used behind the sand bags, tucking the bottom edge of plastic under the first row of bags. In instances where soil erosion is a concern, the use of Erosion Control Bags may be needed. Erosion Control Bags are similar to Flood Control Bags in bag material, size, and weight; but differ in the material with which they are filled. Unlike the Flood Control Bags which are filled with concrete sand, the Erosion Control Bags from RCP Block & Brick are filled with 1/2cuft of 3/8” pea gravel. The use of aggregate as opposed to sand brings a more permeable quality to the bags, allowing some water to move through the bags instead of diverting or holding back the majority of water flow. Although Erosion Control Bags will still divert water, these bags are designed to reduce soil erosion by both stabilizing the soil on which they are laid as well as reducing the strength of water-flow that may carry soil away. Copyright © RCP Block & Brick, Inc. All Rights Reserved.